Vertebrates rely on retinal rods and cones for the conventional, image-forming vision while non-image-forming vision is mediated by intrinsically photosensitive retinal ganglion cells (ipRGCs) (see Part II Chapter 7). Rods are specialized for low-light vision. They are extremely sensitive and can signal the absorption of single photons. Cones mediate daylight vision (Figure 1). They are much less sensitive to light than rods, but have higher temporal resolution. They also mediate color vision by several cone types with different pigment spectra sensitivity. Fig. 1. 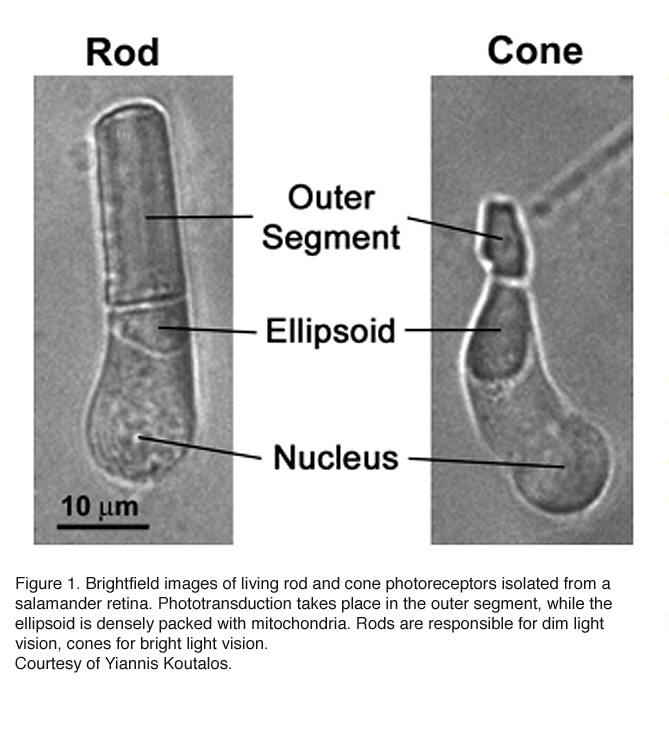 Brightfield images of living rod and cone photoreceptors isolated from a salamander retina. Phototransduction takes place in the outer segment, while the ellipsoid is densely packed with mitochondria. Rods are responsible for dim light vision, cones for bright light vision. Courtesy of Yiannis Koutalos. Great progress has been made in understanding rod phototransduction since the introduction of the suction-electrode recording technique in the late 1970s (Baylor et al., 1979a). Individual amphibian and mammalian (including primate) photoreceptors can be recorded from with this method. Bovine retina, on the other hand, has been a favorite preparation for studying phototransduction by biochemists because of the abundance of tissue available. The mouse, however, has become an increasingly popular animal model for study in the past decade through the advent of gene-targeting techniques. When combined with electrophysiology, mouse genetics provides unmatched power in elucidating the in vivo functions of key phototransduction proteins, most of which have been knocked out, overexpressed or mutated in rods, yielding a rich body of information on the mechanisms underlying the amplification, recovery and adaptation of rod/cone photoresponses (Table 1, Figures 2 & 3). Table 1. List of major proteins involved in mouse rod and cone phototransductions that have been knocked out, overexpressed or mutated1 1) Due to space limitation, not all the genetically engineered mouse lines are listed. For those included, only the most salient phenotypes are listed, please refer to the text for more complete description. 2) Arrestin4 is also called cone arrestin or X-arrestin (Gurevich and Gurevich, 2006; Nikonov et al., 2008) 3) RGS9-1 overexpression was achieved by overexpressing R9AP, which resulted in overexpression of all three components of the GAP complex, RGS9-1, G_5-L and R9AP. I shall first give a brief description of the structure and the development of mouse photoreceptors, followed by a summary of recent studies on rod phototransduction with emphasis on information gleaned from mouse models. Finally, a recent advance in studying mouse cones will be mentioned. 2. Structure of rods and cones. Rods constitute ~97% of mouse retinal photoreceptors, with cones accounting for the remainder (Carter-Dawson and LaVail, 1979). The mouse photoreceptors are broadly similar to primate photoreceptors in physical dimensions (Table 2 & Figure 2). The outer segment is about 1.4 um in diameter and 24 um in length for rods, and, correspondingly, about 1.2 um and 13 um for cones. These dimensions are significantly smaller than those of amphibian photoreceptors (Figure 1), which explain physiologists’ longtime favor for the latter. Rods and cones have four primary structural/functional regions: outer segment, inner segment, cell body and synaptic terminal. The outer segment is connected to the inner segment through a thin connecting cilium. The outer segment is filled with a dense stack of membrane discs (Figures 2 and 3), spaced at intervals of about 28 nm. The discs carry the visual pigment (rhodopsin in rods and cone pigment in cones) and other transduction components either as transmembrane or peripheral membrane proteins (Figure 3). Visual pigment is the most abundant protein in the outer segment. The importance of visual pigment as a major structural component is demonstrated by the rhodopsin-knockout mouse, the rod outer segments of which fail to form (Humphries et al., 1997; Lem et al., 1999). The rod photoreceptors of this mouse degenerate, followed suit by cones. The packing density of pigment molecules on the discs is remarkably uniform across different vertebrate species, being ~25000 mm2, corresponding to a concentration of ~ 3mM (Harosi, 1975). The total number of pigment molecules in the outer segment can thus be calculated roughly from its envelope volume. The dense stack of discs greatly increases the probability of photon capture. An interesting difference between rods and cones is that the rod discs (except for the nascent discs at the base of the outer segment) are completely internalized and therefore physically separate from the plasma membrane, whereas the cone discs remain as foldings of the plasma membrane. The open cone discs offer a much larger surface area for rapid fluxes of substances between the cell exterior and interior, such as chromophore transfer for pigment regeneration and fast calcium dynamics during light adaptation. The inner segment contains the endoplasmic reticulum and the Golgi apparatus. It is also packed with mitochondria immediately adjacent to the outer segment (Figures 2) in order to meet the high demand for metabolic energy associated with phototransduction. All proteins destined for the outer segment must pass through a narrow connecting cilium between the outer and the inner segments. The synaptic terminal transmits the light signal to the second-order neurons in the retina: the bipolar and horizontal cells. In darkness, there is a steady inward current (the “dark current”) through a cation conductance on the outer-segment membrane (Hagins et al., 1970), depolarizing the rod or cone and maintaining a steady synaptic release of glutamate. Light closes this cation conductance (the “light-sensitive” conductance, consisting of cGMP-gated channels) to stop the dark current and produce a membrane hyperpolarization as the response. This hyperpolarization decreases or terminates the dark glutamate release. The signal is further processed by other neurons in the retina before being transmitted to higher centers in the brain. 3. Can we see a single photon? The minimum number of photons required to produce a visual effect was first successfully determined by Hecht, Schlaer and Pirenne in a landmark experiment (Hecht et al., 1942). Human subjects were allowed to stay in the dark for 30 minutes to have optimal visual sensitivity. The stimulus was presented 20 degrees to the left of the point of focus so that the light would fall on the region of the retina with the highest concentration of rods. The stimulus was a circle of red light with a diameter of 10 minutes (1 minute=1/60th of a degree). The subjects were asked whether they had seen a flash. The light was gradually reduced in intensity until the subjects could only guess the answer. It was found that between 54 and 148 photons were required in order to elicit visual experience. After corrections for corneal reflection (4%), ocular media absorption (50%) and photons passed through retina (80%), only 5 to 14 photons were actually absorbed by the retinal rods. The small number of photons in comparison with the large number of rods (500) involved makes it very unlikely that any rod will take up more than one photon. Therefore, one photon must be absorbed by each of 5 to 14 rods in the retina to produce a visual effect. In the same publication (Hecht et al., 1942), Hecht and co-workers determined the visual threshold of human vision by the famous “frequency-of-seeing-curves” experiment. The theory is that photon absorptions vary according to a Poisson probability distribution. If a is the average number of photons absorbed per flash, the probability Pn that any number n will be absorbed is: Pn = an/(ean!). Some of these Possson integral curves (n from 1 to 9) were shown in Figure 5A. By measuring the frequency of seeing against the logarithm of the brightness experimentally, one can fit the experimental curve with one of the probability distribution in Figure 4A to reveal the value n, which lies between 5 and 8 (Figure 4B). This agrees well with the value 5 to 14 photons absorbed by rods! 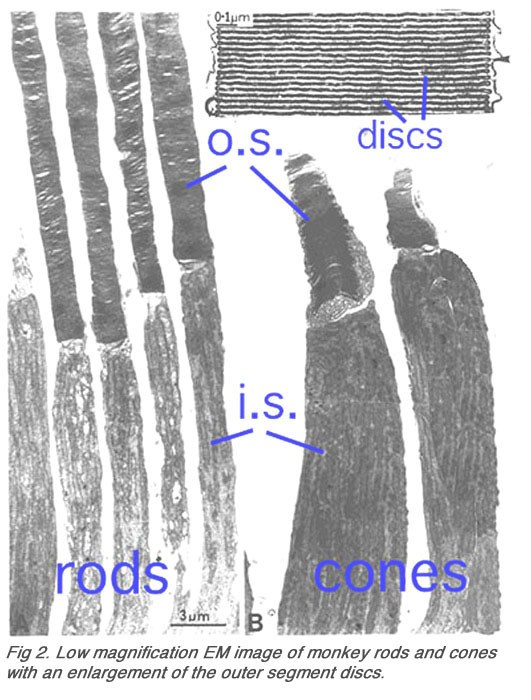 Rods and cones renew their outer segments continually (Young, 1967; Young and Droz, 1968). Newly formed disks at the base of the outer segment progressively displace previously synthesized disks toward the apical end (see chapter on Photoreceptors). The disks reaching the apex of the outer segment are shed and phagocytosed on a daily basis by the adjacent retinal pigment epithelium (RPE) (Young and Bok, 1969). The rate of formation and disposal of the disks are roughly equal so that a constant outer-segment length is maintained in the adult retina. The mouse rod outer segment (ROS) changes little in diameter during development, but it elongates at a rapid and almost linear rate from postnatal day (P) 11 to 17, reaching adult length by P19-25 (LaVail, 1973). The increase in ROS length parallels the almost linear rise in rhodopsin content from P8 to P23 (Caravaggio and Bonting, 1963). At the peak rate of growth during P13-P17, ~120 disks are synthesized per day compared with 75 disks in adult retina (LaVail, 1973; Young, 1967). The dark current recorded in developing mouse rods increases roughly in direct proportion to the length of the mouse ROS between P12 (around the time of eye-opening in neonate) and P45 (adult) (Luo and Yau, 2005). The kinetics of the dim-flash response changes rather little during development and the flash sensitivity of rods increases by approximately 1.5-fold, reflecting the presence in neonatal rods of a small percentage (~1%) of free opsin (i.e. devoid of chromophore) even after overnight dark-adaptation. The constitutive activity of this small amount of opsin mildly triggers adaptation mechanisms and therefore causes a small reduction in the sensitivity of the cell (see later). A similar small, age-dependent increase in rod sensitivity was found for rat. Previously, a 50-fold increase in rod sensitivity was reported for rat from neonate to adulthood (Ratto et al., 1991), but now this appears to be incorrect. Psychophysical experiments performed by Hecht, Schlaer and Pirenne in 1942 suggested that human retinal rods can detect single photons (Hecht et al., 1942) (Figure 4). Thirty seven years later, suction pipette recordings from isolated toad rods by Baylor, Lamb and Yau confirmed this remarkable ability of vertebrate rods (Figure 5) (Baylor et al., 1979a, b). The amazing ability of vertebrate rods to detect single photons can be attributed to at least three factors: high quantum efficiency of photoactivation, low intrinsic noise, and a powerful signal amplification cascade. Two other factors greatly increase the photon capture ability of vertebrate rods, numerical dominance of rods over cones and a highly specialized outer segment structure. The dense stack of discs of the rod outer segment ensures that virtually every photon traveling axially will be captured. In a sense, vertebrate rods can be viewed as sophisticated three-dimensional photon capture devices. Rod phototransduction is one of the best-characterized G-protein-signaling pathways (Figures 6 – 8). The receptor is rhodopsin (R), the G protein is transducin (G), and the effector is cGMP phosphodiesterase (PDE or PDE6). 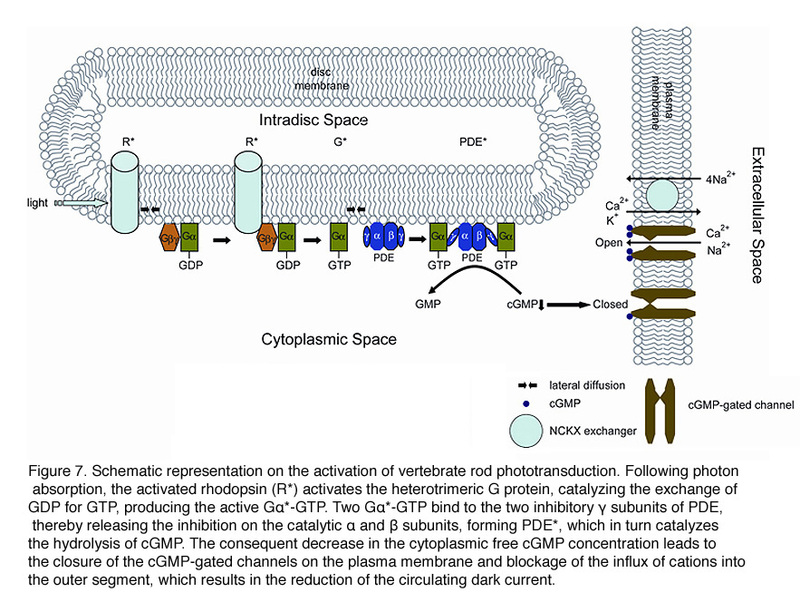 Upon photon absorption, the rhodopsin molecule becomes enzymatically active (R*) and catalyzes the activation of the G protein transducin to G*. Transducin, in turn, activates the effector phosphodiesterase (PDE) to PDE*. PDE* hydrolyzes the diffusible messenger cGMP. The resulting decrease in the cytoplasmic free cGMP concentration leads to the closure of the cGMP-gated channels on the plasma membrane. Channel closure leads to localized reduction on the influx of cations into the outer segment, which results in membrane hyperpolarization, i.e. the intracellular voltage becoming more negative (Figures 6 and 8). This hyperpolarization decreases or terminates the dark glutamate release at the synaptic terminal. The signal is further processed by other neurons in the retina before being transmitted to higher centers in the brain. This phototransduction cascade is shown in Figures 6 and 7. Following light activation, a timely recovery of the photoreceptor is essential so that it can respond to subsequently absorbed photons, and signal rapid changes in illumination (see Figure 8). This recovery from light requires the efficient inactivation of each of the activated components: R*, G*, and PDE*, as well as the efficient regeneration of rhodopsin (R) and the rapid restoration of the cGMP concentration. The termination rates of the activation steps set the time course of the photoresponse. Although rod phototransduction is the best characterized sensory transduction pathway, rods differ from other sensory cells in that light leads to hyperpolarization rather than depolarization. Rods respond to light with graded hyperpolarization whose amplitude increases monotonically as a function of flash intensity until saturation. One hallmark of rod phototransduction is the reproducibility of its single-photon response in both amplitude and kinetics. This is quite remarkable considering the fact that events generated by single molecules are stochastic in nature. The study on the underlying mechanisms has long been a hot topic in the vision field. Recent research pointed to two possible mechanisms: 1. Rhodopsin inactivation is averaged over multiple shutoff steps so that the integrated R* activity varies less than otherwise controlled by a single step. 2. Averaging over the deactivation of multiple G protein molecules is important for the constancy in response decay. The details of the activation phase of rod phototransduction are now well established. A quantitative description is achieved that reproduces the activation kinetics of the rod response under physiological conditions (Arshavsky et al., 2002; Lamb, 1996; Lamb and Pugh, 1992; Pugh and Lamb, 1993). We shall discuss below the major proteins mediating the activation phase in mouse rods – visual pigment, transducin, the effector PDE, and the cGMP-gated channel. The focus will be on studies with combined approaches from mouse genetics and physiology. Mouse has a single rod pigment, rhodopsin, and two cone pigments: S- and M- cone pigments, with maximal spectral sensitivity at 360 nm and 508 nm, respectively. Mouse is unusual in that individual cones express both S- and M-cone pigments, with the M-pigment level decreasing in a gradient from dorsal to ventral retina (Applebury et al., 2000). Mouse rhodopsin and cone pigments belong to the super family of G-protein coupled receptors (GPCRs). A high-resolution (2.8 Å), three-dimensional structure of the ground state of bovine rhodopsin was determined in 2000 by Palczewski et al. (Figure 9b) (Palczewski et al., 2000; Stenkamp et al. 2002). The future challenge is to solve the structure of cone pigments, which is much more unstable than rhodopsin. Visual pigments from most vertebrate species, including mammals, use 11-cis-retinal (denoted A1), while those from many water-based animals use 11-cis-3,4-dehydroretinal (denoted A2), as their natural ligand (Bridges, 1972; Dartnall and Lythgoe, 1965; Wald, 1939). George Wald first identified vitamin A in the retina (Wald, 1935) and later showed how it functions with light, which forms the molecular basis of vision (Nobel Prize 1967). The chromophore is covalently bound via a Schiff-base linkage to a conserved lysine residue (K296 in mammalian rhodopsin) in the seventh transmembrane helix (Figure 9 and 9b). In darkness, the 11-cis-retinal acts as an inverse agonist to lock rhodopsin in an inactive state by preventing free opsin from activating the transduction cascade. The “locking” role of 11-cis-retinal as was clearly demonstrated in RPE65-null mice. RPE65 functions as an isomerase in the RPE visual cycle, which is important for regenerating rod and cone pigments. Rpe65-/- retina has virtually no 11-cis-retinal (Redmond et al., 1998). Rod photoreceptors degenerate slowly due to the constant activation of phototransduction by the large amount of free rod opsin. This degeneration can be prevented by deleting the transducin α-subunit, which blocks the activation of the downstream cascade (Woodruff et al., 2003). In a separate experiment, K296 is mutated to glutamic acid, producing an opsin with no chromophore-binding site (Li et al., 1995). Although the K296E opsin constitutively activates transducin in vitro, the constitutive activity of the mutant opsin in vivo was turned off due to phosphorylation by rhodopsin kinase followed by arrestin binding (see R* termination). Even with 11-cis-retinal attached, rhodopsin occasionally undergoes spontaneous (thermal) activation in the dark, producing responses identical to those triggered by photons (Baylor et al., 1980). Spontaneous activation of visual pigment molecules sets an ultimate limit on visual sensitivity (Aho et al., 1988; Autrum, 1943.; Barlow, 1956; Donner, 1992). In a toad rod, the rate of thermal activation of rhodopsin was measured to be 0.031 s-1rod-1 at 22 (C, corresponding to an average wait of 2000 years for the spontaneous activation of a given rhodopsin molecule to occur, based on a total of 2×109 rhodopsin molecules per cell (Yau et al., 1979). This great stability makes it possible for rods to pack many rhodopsin molecules to the rod discs to increase its photon-capture ability while keeping the dark noise low. In wild-type mouse rods, it is rather difficult to measure the discrete noise arising from the thermal activation of rhodopsin because of the relatively small amplitude of the single-photon response. However, the measurement has been achieved with GCAPs-/- rods (Burns et al., 2002), the single-photon response of which is nearly five times that of wild type as a result of the elimination of the Ca2+-mediated negative feedback on guanylate cyclase (see later). The rate is ~0.012 s-1rod-1 at 36℃. It should be mentioned that the question of dark noise in vision has had a long intellectual history from the point of view of psychophysics and system neuroscience. As early as 1940s and 1950s, Hecht and Barlow have estimated the amount of “dark light” in human rods based on psychophysical experiments (Barlow, 1957; Hecht et al., 1942). 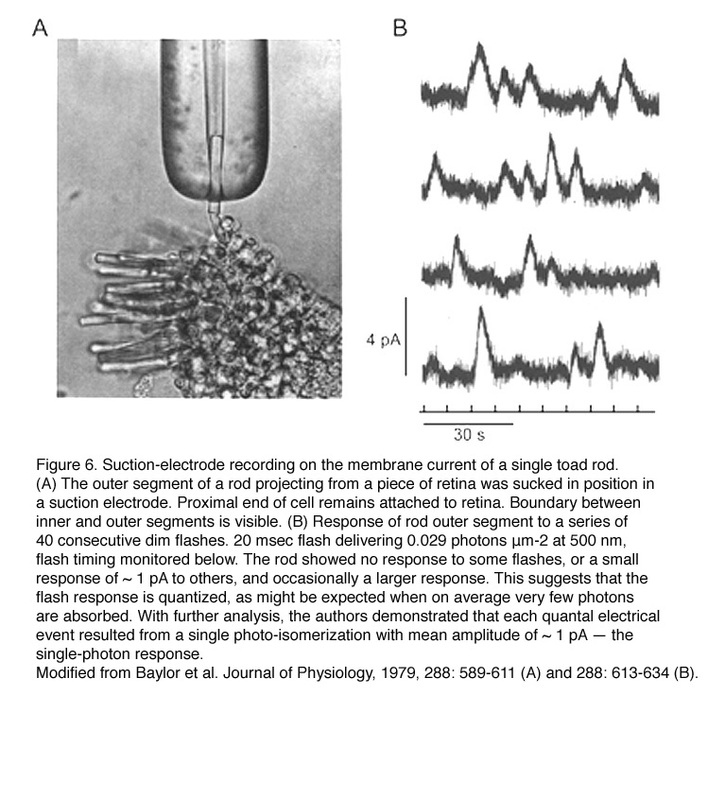 More than 30 years later, Baylor and colleagues used suction-pipette recording technique on primate rods to demonstrate that the very low quantal noise from rhodopsin, corresponding to ~ 0.01 event s-1 rod-1 in darkness (Baylor et al., 1984; Schneeweis and Schnapf, 2000), indeed matches the human psychophysical scotopic threshold. The quantitative agreement between the quantal noise measured from single rods and that measured in human psychophysics was considered a breakthrough in the vision field and a wonderful convergence between cell physiology and human psychophysics/system neuroscience – the goal of modern neuroscience after all! Red cone pigment is much more prone to spontaneous isomerization than rhodopsin (Kefalov et al., 2003; Rieke and Baylor, 2000), but it is difficult to measure the rate from native cones (Kefalov et al., 2003). By expressing human red cone pigment transgenically in GCAPs-/- rods, the rate of human red cone pigment was found to be surprisingly low at ~10 s-1cone-1 (molecular rate constant ~1.35 x 10-7 sec-1) (Fu et al., 2008), almost 1000-fold lower than the overall dark transduction noise previously reported in primate cones (Schnapf et al., 1990; Schneeweis and Schnapf, 1999). Thus, the overwhelming amount of dark noise in the primate red cone originates not from spontaneous isomerization of the pigment, but most probably from constitutive activity in the downstream phototransduction steps, such as the phosphodiesterase (Holcman and Korenbrot, 2005). The molecular rate constant for thermal isomerization of A2 human red cone pigment was determined to be ~5.6 x 10-6 sec-1 by expressing human red cone pigment in Xenopus rods (Kefalov et al., 2003). Since mammals use A1 chromophore, A1 red cone pigment is perhaps 40-fold less prone to spontaneous isomerization than the A2 form (Fu et al., 2008). This is likely due to the fact that the A2 chromophore has an additional double bond in the β-ionone ring, which has been suggested to lower the energy barrier for isomerization (Bridges, 1967). Consequently, this introduces a red shift in absorption (Donner et al., 1990) and decreases the thermal stability of the A2 pigment. Incidentally, A1 rhodopsin was found to be 30 times more stable than A2 rhodopsin, rather similar to the finding for red cone pigment (Ala-Laurila et al., 2007). More importantly, unlike in lower vertebrates such as salamander where A2 red cone pigment is sufficiently noisy as to impose a potential adaptational influence on cones even in darkness (Kefalov et al., 2003; Kefalov et al., 2005; Rieke and Baylor, 2000), A1 red cone pigment (and likewise for green and blue cone pigments) in primates and presumably other mammals should be quiet enough to have hardly any adaptational influence on cone sensitivity. In other words, the much lower absolute sensitivity of mammalian cones compared to mammalian rods appears to arise not from quantal noise in the pigments themselves, but from other phototransduction steps (Miller et al., 1994; Nakatani and Yau, 1989; Tachibanaki et al., 2007). This may explain why primate red, green and blue cones, unlike their amphibian counterparts (Ma et al., 2001; Perry and McNaughton, 1991), all have similar sensitivities irrespective of their difference in visual pigments (Schnapf et al., 1990). Photon absorption by 11-cis-retinal triggers the cis-to-trans isomerization of the retinoid (Hubbard and Wald, 1952; Wald, 1951). 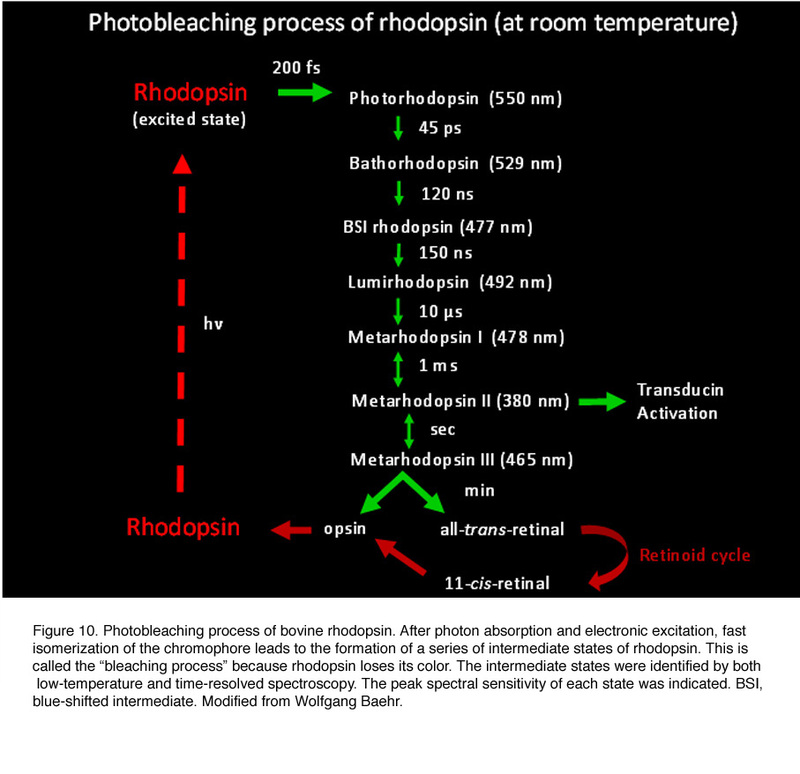 As early as in the 1930s-1950s, vision scientists knew that rhodopsin bleaches in stages over intermediates that were short-lived at room temperature, yet stable at low temperatures (Lythgoe and Quilliam, 1938; Wald, 1938; Wald et al., 1950) (Figure 10). Hubbard and Kropf measured the “bleaching intermediates (a mixture of lumirhodopsin and metarhodopsin) ” by spectrophotometry at -17 ℃ (Hubbard and Kropf, 1958). Photo-isomerization rapidly converts the ligand from a powerful inverse agonist to a powerful agonist, leading to the formation of a series of spectrally distinct intermediates of rhodopsin in the order of bathorhodopsin, lumirhodopsin, metarhodopsin I (Meta I), and metarhodopsin II (Meta II) within a few millisecond (reviewed in Okada and Palczewski, 2001) (Figure 10). Meta II is the active form of rhodopsin (R*), which in turn decays to the inactive Meta III. The Meta-II state of cone pigment decays 50 times more rapidly than that of rhodopsin (Imai et al., 1997; Kuwayama et al., 2005; Shichida et al., 1994). Despite this difference, rhodopsin and transgenic red cone cone pigment, and vice versa, signal identically downstream when compared side-by-side in the same Xenopus rod or cone (Kefalov et al., 2003). The same was found for rhodopsin and transgenic red cone pigment in mouse rod (Fu et al., 2008). Thus, not only do rod and cone pigments interact with a given transducin, pigment kinase and arrestin in quantitatively identical ways, but the shutoff mediated by pigment kinase and arrestin also precedes the Meta-II decay of rod and cone pigments, rendering the decay of Meta II non-rate-limiting under normal conditions (see R* termination). Retinal absorbs maximally in the UV-range (max ~380 nm) when in solution or bound to opsin in the unprotonated form. The absorption shifts into the visible region when the Schiff-base (SB) is protonated. Like other vertebrate pigments, mouse rhodopsin and M-cone pigment are protonated. On the other hand, mouse S-cone pigment is unprotonated, explaining its absorption in the UV-region (Vought et al., 1999). The positively charged Schiff-base is stabilized by the counterion E113 (residue number according to mouse rhodopsin) in rhodopsin and M-cone pigment (Nathans, 1990; Palczewski et al., 2000; Sakmar et al., 1989; Zhukovsky and Oprian, 1989). 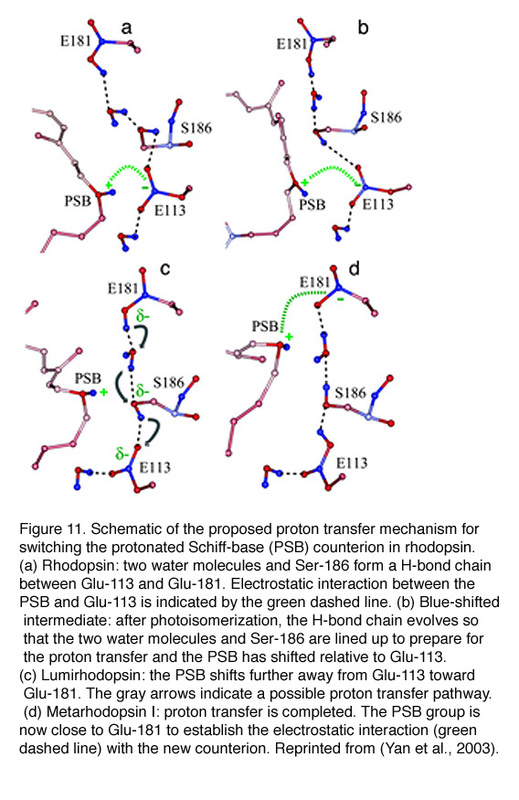 Rhodopsin activation involves a “counterion switch” mechanism in which E181 located in the extracellular loop II transfers a proton via a hydrogen-bonded network to the primary counterion, E113, during the formation of Meta I. Therefore, E181 replaces E113 as the counterion to stabilize the protonated Schiff-base in the transition stage before its eventual deprotonation (Yan et al., 2003) (Figure 11). Because the mouse S-cone pigment is not protonated and the nearby E113 is neutral, the interesting questions are: does a protonation event occur during light activation, and does it involve a “counterion switch” mechanism? 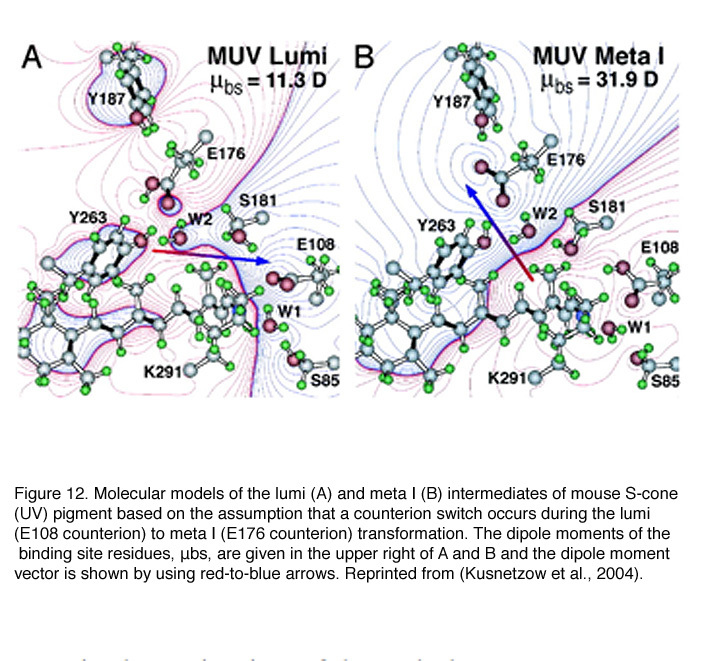 Remarkably, after the 11-cis isomerization, the Schiff-base picked up a proton in the Lumi state from E108 to become transiently protonated (Dukkipati et al., 2002) and a counterion switch occurs from E108 (E113 in rhodopsin) to E176 (E181 in rhodopsin) during the Lumi to Meta I transition, in close analogy to rhodopsin (Kusnetzow et al., 2004) (Figure 12). The photoactivation mechanism of S-cone pigment, SB → PSB (protonated Schiff-base) (+):E108(-) → PSB(+):E176(-) → SB, makes vision possible in the UV region. Thus, the counterion switch appears to be a general mechanism for the activation of all visual pigments. The decay of R* eventually leads to the departure of all-trans-retinal from the protein. The all-trans chromophore is converted back to 11-cis-retinal through a cascade of enzymatic reactions called the visual cycle in the adjacent RPE, before being used again for the regeneration of visual pigments (for example, see review McBee et al., 2001). Visual pigment is a major structural component of rods and cones. It is not surprising that genetic deletion of mouse rhodopsin results in rods without proper outer-segment formation (Humphries et al., 1997; Lem et al., 1999). Is half the amount of normal rhodopsin enough for maintaining a healthy ROS? In rho+/- mouse, rods are properly formed despite only half of the normal level of rhodopsin being present. However, a progressive mild degeneration of the rods does occur. Interestingly, the activation rate of the photoresponse of rho+/- rods is twice that of normal (Calvert et al., 2001). The explanation for this observation was originally proposed that a lower rhodopsin concentration reduces protein crowding on the disc membrane, thereby increasing rhodopsin’s diffusion coefficient and its rate of encounter with transducin. This finding thus would point to the diffusional encounter of transducin by photoexcited rhodopsin as the rate-limiting step in the activation of the rod photoresponse. However, Liang et al. 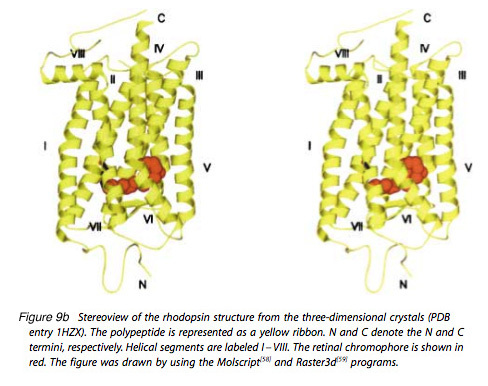 subsequently reported that rods in rho+/- mouse are not completely normal in that rhodopsin exists in small raft-like structures as well as in large and organized para-crystals (Liang et al., 2004). In addition, there is an approximate 40% reduction in the ROS volume, in the rhodopsin content and in the 11-cis-retinal level in these cells. These authors suggested that the observed acceleration of phototransduction in rho+/- rods was not due to a lower density of rhodopsin on the disc surface but to the structural changes in the whole ROS. The quantum efficiency of photoactivation measures the probability that the adsorption of a photon initiates photoactivation. This probability is defined as the ratio between the number of photoactivated molecules and the number of molecules that absorbed a photon. Quantum efficiency of visual pigments is wavelength-independent at ~ 0.7 in the spectrum of visible light whereas it falls to about 0.25 for wavelengths shorter than 300 nm (Kropf, 1982). This suggests that every absorbed photon in the visible range can activate rhodopsin equally well. The quantum efficiency of 0.7 is very similar across all visual pigments. This high efficiency seems to be a common feature of most vertebrate visual pigments. Photoactivated pigment binds the transducin heterotrimer and catalyzes the exchange of GTP for GDP on the α-subunit. Gα-GTP (G*) dissociates from R* as well as its native partners, Gβν and interacts with the cGMP phosphodiesterase (PDE) to carry the signal forward. Released R* is free to activate additional transducin molecules. Transducin activation by R* represents the first amplification step in the phototransduction cascade. The estimated rate of transducin activation by a single R* has ranged from 10 to over 3000 s-1 at room temperature (for review see Pugh and Lamb, 1993). More recently, a rate of ~ 120 s-1 was reported to be more consistent with biochemical, light-scattering, and electrophysiological measurements (Leskov et al., 2000, but see Heck and Hofmann, 2001). The rate is roughly doubled in mammalian rods due to a difference in body temperature. Until recently, it was believed that over a hundred transducins are activated during the lifetime of a single R* in mammalian rods (e.g. Makino et al., 2003). This number is now revised to be ~ 20 in mouse rods, based on the shorter life time of R* (80 msec) and 240 s-1 activation rate of transducin by R* (Krispel et al., 2006). Transducin is present at 10% the amount of pigment. Rods and cones have different isoforms of transducin, being Gαt1Gβ1ν1 in rods and Gαt2Gβ3ν8 in cones (Fung et al., 1992; Lee et al., 1992; Lerea et al., 1986; Peng et al., 1992). The C-terminal of the ν subunit is farnesylated and the N-terminal of the α subunit is acylated (Fukada et al., 1990; Kokame et al., 1992; Neubert et al., 1992). These lipid modifications help anchor the holo-transducin to the disc membrane. The importance of transducin for conveying the signal from R* to PDE was confirmed by gene-targeting experiments, in which rods of Gαt1-null mice (gnat1-/-) were found to lose all light sensitivity (Calvert et al., 2000). The gnat1-/- mouse line has proven to be a valuable tool for blocking rod phototransduction in many studies (Fu et al., 2005; Hattar et al., 2003; Lyubarsky et al., 2002; Nikonov et al., 2006; Woodruff et al., 2003). It was also used successfully to delineate two apoptotic pathways in light-induced retinal degeneration (Hao et al., 2002). Bright light triggers apoptosis of photoreceptors through a mechanism requiring the activation of rhodopsin but not transducin signaling. In contrast, low-intensity light induces apoptosis that is predominantly dependent on transducin signaling. Almost two decades ago, rod transducin was found to undergo light-dependent redistribution (Brann and Cohen, 1987; Whelan and McGinnis, 1988). Great progress has been made in the past few years by using mouse (or rat) models for study. Both Gαt2 and Gβ1ν1 subunits are present predominantly in the ROS in darkness, but translocate in bright light, with slightly different time courses, to the inner segment and the inner nuclear layer (Kassai et al., 2005; Sokolov et al., 2002). 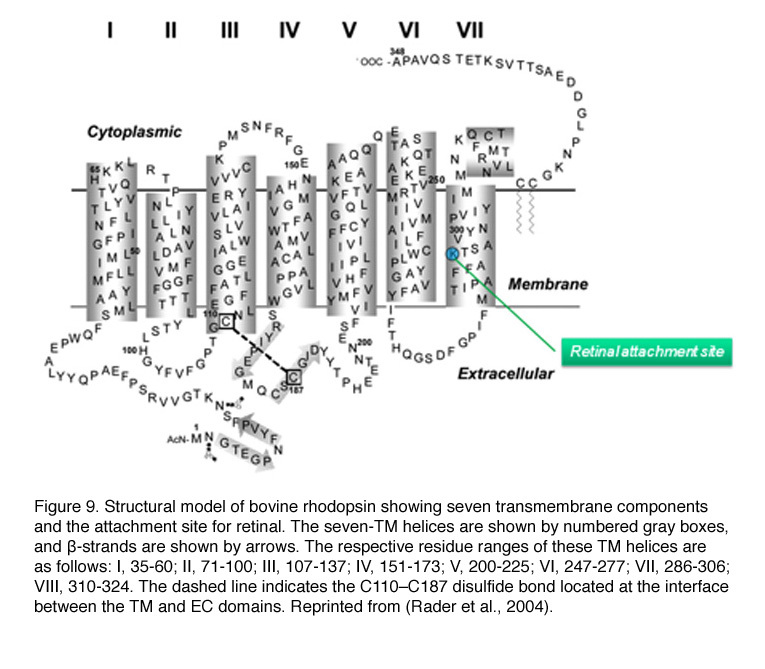 This phenomenon has been suggested to contribute to light adaptation of rods (Sokolov et al., 2002), but others argue that the main function of transducin translocation is to provide protection for rods in bright light when rods contribute little to vision (Elias et al., 2004). In contrast, Gαt2 has been found not to translocate from the cone outer segment (COS) in light under physiological conditions (Coleman and Semple-Rowland, 2005; Elias et al., 2004; Kennedy et al., 2004) and only translocates away from the cone outer segment under very high-intensity light (Chen et al., 2007). This might be consistent with the need for cones to function in bright light (Elias et al., 2004). Gν1 in rods and Gν8 in cones are farnesylated with a 15-carbon chain, but all other Gν subunits are geranylgeranylated with a 20-carbon chain. What is the significance of this difference? Knock-in mice expressing geranylgeranylated instead of farnesylated Gν1 exhibited impaired properties in light adaptation because the stronger attachment by geranylgeranylation attenuated the light-dependent translocation of Gν1 from ROS to the inner region (Kassai et al., 2005). It thus appears that the selective farnesylation is important for the regulation of visual sensitivity by providing sufficient but not excessive anchoring of Gβ1ν1to the membrane. 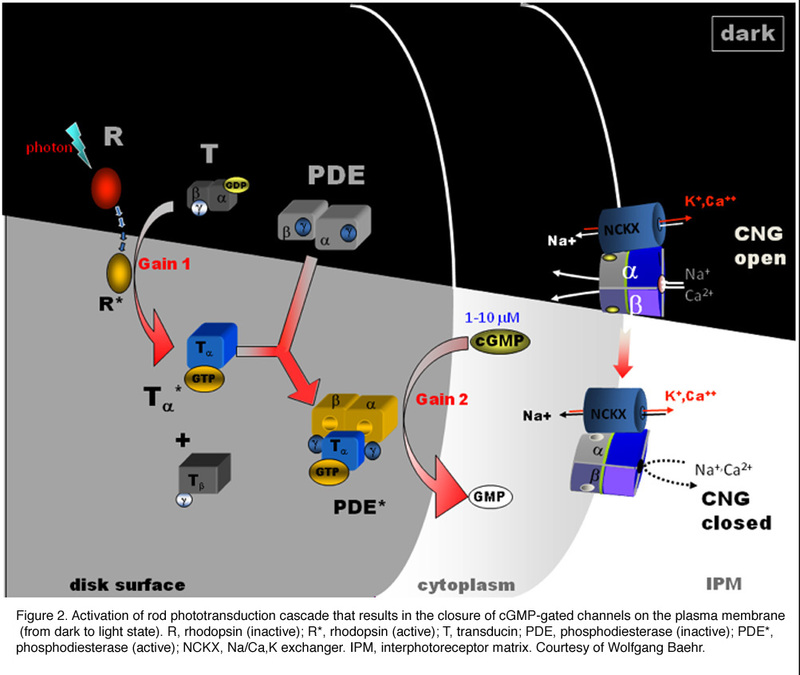 PDE is the third component of vertebrate phototransduction. It is a tetrameric protein consisting of two equally active catalytic subunits, α and β, and two identical ν subunits (Baehr et al., 1979; Deterre et al., 1988; Hurley and Stryer, 1982). PDE is anchored to the disc membrane by isoprenylation of the C-termini of the two catalytic subunits (Anant et al., 1992; Qin and Baehr, 1994). The density of PDE is ~1-2% of rhodopsin. Thus, the first three components of phototransduction are present in the ratio of 100R:10G:1PDE. In the dark, the two ν subunits act as inhibitory subunits by binding to the two catalytic subunits. In the light, Gα-GTP encounters PDEν and sterically displaces the latter (still associated with PDEαβ, therefore relieving its inhibitory effect on the catalytic subunits and permitting the hydrolysis of cGMP to proceed. In contrast to the amplification achieved during transducin activation by R*, the activation of PDE by G* constitutes no gain, i.e. with an efficiency approaching at most unity. It is the catalytic power of PDE* that provides the second amplification step. It was reported that PDE* hydrolyzes cGMP at a rate close to the limit set by aqueous diffusion, with a Km of ~ 10 μM and a Kcat of 2200 s-1 (Baehr et al., 1979; Leskov et al., 2000). The combined amplification provided by rhodopsin and PDE are very high (~ 105-106), ensuring the high sensitivity of rods, including the ability of rods to detect single photons (for review see Pugh and Lamb, 1993; Pugh and Lamb, 2000). One might have expected that the deletion of PDEν from mouse rods would unleash the full catalytic power of PDEαβ. However, Tsang et al. found that, in the absence of PDEν, the PDEαβ dimer actually lacked hydrolytic activity, and the photoreceptors of the mutant mouse rapidly degenerated (Tsang et al., 1996). Thus, the inhibitory PDEν subunit appears to be necessary for the integrity of the catalytic PDEαβ subunits. The degeneration might be caused by an abnormally high cGMP concentration due to the lack of hydrolysis. A related example is the rd mouse, which is one of the best-known models for retinal degeneration. The rod cells in the rd mouse begin to degenerate at about P8, followed by cones; by 4 weeks, virtually no photoreceptors are left (Carter-Dawson et al., 1978; LaVail and Sidman, 1974). Degeneration in this mouse model is preceded by the accumulation of cGMP in the retina, correlated with deficient activity of the rod PDE due to a mutation in the β subunit (Bowes et al., 1990; Pittler and Baehr, 1991). It is worth noting that the rd mouse was instrumental in suggesting that inner retinal neurons could mediate non-image-forming vision (Freedman et al., 1999; Lucas et al., 1999). In addition to its inhibitory function, PDEν accelerates the GAP (GTPase Activating Protein) activity of G* for self-shutoff (see G*-PDE* termination). Mouse rods carrying the W70A point mutation of PDEν which impairs the Gαt1-PDEν interaction, showed a greatly reduced sensitivity to light and a slower recovery from the flash response than wild type (Tsang et al., 1998). By 1970, scientists generally believed that a second messenger was required to mediate the rod photoresponse based on several lines of evidence. First, light absorption occurs on the rod disc membrane, whereas the light sensitive conductance is in the plasma membrane. Since rod discs are separate from the plasma membrane, a second messenger is required to connect the two. Second, the dim-flash response of rods lasts a few seconds, which is too long to be accounted by the open time of known membrane conductance. However, it took more than a decade before the identity of the second messenger was finally determined to be cGMP (reviewed in Luo et al., 2008). The “fierce” battle was “fought” on the validity between two competing candidates, Ca2+ and cGMP. According to the Ca2+hypothesis, which was first proposed by Hagins, the concentration of intracellular free Ca2+ is low in the dark and rises in the light to block light-sensitive current. The main supporting evidence was that reducing the concentration of external Ca2+ dramatically increases the dark current, suggesting internal Ca2+ inhibits the dark current. On the other hand, the cGMP hypothesis proposed that the concentration of cGMP was high in the dark to maintain a cGMP-dependent conductance. Light led to the hydrolysis of cGMP and the subsequent closing of the conductance. The supporting evidence is that intracellular injection of cGMP increases the amplitude and latency of the photoresponse. Adding to the complexity is the finding that the free cGMP concentration varies inversely with the free Ca2+concentration in rods, making it difficult to separate the effect of the two. This debate was finally settled with the discovery of cGMP-gated channels in rods by Fesenko and colleagues in 1985 (Fesenko et al., 1985). By using the patch-clamp technique, they showed that cGMP increased a cation conductance of inside-out patches of outer-segment plasma membrane without the need of ATP. The direct channel gating by cGMP is surprising because cyclic nucleotides were generally believed to act through cyclic-nucleotide dependent kinases and protein phosphorylation on target proteins at that time. This dogma partially explained scientists’ reluctance to embrace the cGMP hypothesis because protein phosphorylation was too slow. Another monumental work by Yau and Nakatani was published at the same year that helped the anointment of cGMP as the right candidate (Yau and Nakatani, 1985). An identical cGMP-gated cation conductance was found on a truncated rod outer segment with an intact plasma membrane. Most importantly, this conductance could be suppressed by light, suggesting that the long-sought light-sensitive conductance is the cGMP-gated conductance. The publications by Fesenko and Yau marked the end of the Ca2+ hypothesis. The cGMP-gated channel belongs to the family of cyclic-nucleotide-gated (CNG) channels, which are non-selective cation channels (reviewed in Kaupp and Seifert, 2002; Molday and Kaupp, 2000). The channel is located on the plasma membrane and is the last component in the activation phase of phototransduction. In the dark, a basal concentration of one to several (M cGMP keeps a small percentage of the CNG channels open (Yau, 1994). The decline in cGMP concentration upon illumination leads to rapid closure of the channels with a sub-millisecond delay (Karpen et al., 1988). The gating of the rod channel by cGMP is cooperative with a Hill coefficient of ~ 3; therefore, the light-triggered suppression of the dark current is 3 times larger than the decrease in the intracellular cGMP concentration. For a long time, the rod channel was believed to be a hetero-tetramer consisting of 2 CNGA1 and 2 CNGB1 subunits. In 2002, a number of laboratories made the surprising discovery that the rod channel actually has a 3CNGA1:1CNGB1 subunit composition (Weitz et al., 2002; Zheng et al., 2002; Zhong et al., 2002), whereas the cone channel supposedly exhibits a 2CNGA3: 2CNGB3 stoichiometry (Peng et al., 2004). CNGA1 and CNGA3 subunits form functional homomeric channels by themselves when heterologously expressed. Although CNGB1 and CNGB3 do not form functional channels by themselves, they confer several properties typical of native channels when co-expressed with A subunits: flickery opening behavior, increased sensitivity to L-cis-diltiazem (a CNG channel-specific inhibitor), and weaker block by extracellular calcium (Biel et al., 1999b; Finn et al., 1996; Kaupp and Seifert, 2002; Matulef and Zagotta, 2003). In humans, mutations in CNGA1 causes retinitis pigmentosa (Dryja et al., 1995), while mutations in both CNGA3 (Kohl et al., 1998) and CNGB3 (Kohl et al., 2000) cause achromatopsia. Mouse models carrying null mutations of CNGB1 (Huttl et al., 2005) and CNGA3 (Biel et al., 1999a) are available. CNGB1 was found to be crucial for the targeting of the native CNG channel in rods. Thus, only trace amounts of the CNGA1 subunit were found on the ROS in CNGB1-null mice and the majority of rod photoreceptors failed to respond to light (Huttl et al., 2005). CNGA3-deficient mice selectively lost their cone photoresponse with the rod pathway intact. Analogous to the case of rod transducin, CNGA3-null mice were used to block cone phototransduction in studying the intrinsically photosensitive retinal ganglion cells (Fu et al., 2005; Hattar et al., 2003). In the dark, the concentration of free cGMP in the rod outer segment was estimated to be several μM, which is lower than the K1/2 (~ 10-40 μM depending on Ca2+ concentration), the concentration of cGMP necessary to half-maximally activate the channel. As a result, only ~ 1% of the CNG channels are open! In other words, 99% of the channels are already closed in the dark and light can only suppress the remaining 1% channels. This explains why current induced by cGMP injection is more than 10 times larger than the dark current. The inward current through the cGMP-gated channel is composed of ~85% Na+ because Na+ is the predominant external cation and the channel is non-selective to monovalent cations. The remaining current is mainly carried by Ca2+ with a minor contribution from Mg2+ (Chen et al., 2003a; Yau, 1994). Extracellular Ca2+ actually partially blocks the channel to reduce its conductance under physiological conditions. The inward current is balanced by an outward current flowing across the inner-segment membrane, which is mainly carried by potassium ions. This “circulating current” is also called “dark current” in both rods and cones (Hagins et al., 1970). Unlike other ligand-gated channels, the CNG channel does not desensitize to cGMP, which is important for rods to maintain a steady dark current ranging between 20 and 70 pA in vertebrate rods. The rod photoresponse is essentially a transient suppression of the circulating current. It was estimated that the dark current was carried by ~ 10,000 channels. The participation of large numbers of “micro” channels averages out the channels noise, i.e. reduce an otherwise substantial stochastic channel noise if the dark current were carried out by a few “macro” channels. This feature improves the sensitivity of rods. Two extrusion mechanisms are critical to maintain ionic balance in rods. An energy-dependent Na-K ATPase at the inner segment pumped Na+ out and K+ into the cells. A Na/Ca,K exchanger (NCKX) in the outer-segment plasma membrane extrudes one Ca2+ and one K+ outward in exchange for four Na+ inward producing the net entry of one positive charge. The exchanger and the CNG channel were found to form a stable complex on the plasma membrane, likely as a way to control the stoichiometry between the two, which is critical for regulating Ca2+ concentration in the rod outer segment. During the light response, the influx of Ca2+ is reduced due to the closure of some CNG channels while the efflux of Ca2+ through the exchanger is maintained. The resulting Ca2+ decline triggers negative feedback to produce light adaptation. Following light activation, a timely recovery of the photoreceptor is essential so that it can respond to subsequently absorbed photons, and signal rapid changes in illumination. This recovery from light requires the efficient inactivation of each of the activated components: R*, G*, and PDE*, as well as a rapid restoration of the cGMP concentration. The termination rates of the activation steps set the time course of the photoresponse. In the past decade, knowledge gained from genetically engineered mouse lines has provided major advances in understanding the termination of the rod photoresponse. In the following sections, we shall discuss separately the events responsible for the inactivations of R*, G* and PDE*, followed by the restoration of cGMP. Activated rhodopsin (R*) is inactivated by a two-step process. First, R* is phosphorylated by rhodopsin kinase (GRK1), which lowers the activity of R*. Second, the protein arrestin (Arr1) binds to phosphorylated R*, capping its residual activity (Kuhn and Wilden, 1987; Wilden et al., 1986). Multiple serine/threonine residues at the C-terminal of rhodopsin (six in mice and seven in humans) provide the phosphorylation sites for GRK1. Cone pigments have more potential phosphorylation sites at the C-terminal than rhodopsin. For example, human red cone pigment has 10 such sites. Even though biochemical experiments originally suggested that rhodopsin is predominantly phosphorylated at only one serine residue following light exposure (Ohguro et al., 1995), subsequent recordings from transgenic mouse rods carrying phosphorylation-site mutations suggested that the reproducible deactivation of R* requires at least three phosphorylation events (Mendez et al., 2000). In addition, all six sites need to be phosphorylated in order for the normal decline of the response to proceed. Multiple phosphorylation events are also proposed to underlie the reproducibility of rod responses to single-photons (Gibson et al., 2000; Hamer et al., 2003; Mendez et al., 2000). Despite the fact that events generated by single molecules are stochastic in nature, the single-photon response of rods shows remarkable reproducibility in amplitude and shape (Baylor et al., 1979b; Rieke and Baylor, 1998; Whitlock and Lamb, 1999). By averaging over multiple shutoff steps, the integrated R* activity varies less than otherwise controlled by a single step. This hypothesis is supported by experiments using transgenic mouse rods carrying phosphorylation-site mutations (Doan et al., 2006). The authors showed that the reproducibility of the single-photon response varies in a graded and systematic manner with the number, but not the identity, of the phosphorylation sites. Each phosphorylation site provides an independent step in rhodopsin deactivation and that, collectively, these steps tightly control the lifetime of R*. Much less is known about the role of the phosphorylation sites in cone pigments. The only in vivo experiment was done by Kefalov et al. (Kefalov et al., 2003), showing that transgenic frog rods expressing a human red cone pigment with all 10 putative phosphorylation sites mutated gave a prolonged response. It suggests that activated cone pigment is quenched by a similar two-step shutoff mechanism even though its active lifetime is much shorter than that of rhodopsin. In addition to mutations of all of the C-terminal serine and threonine residues to alanine (Mendez et al., 2000), rhodopsin phosphorylation can also be prevented by deleting the C-terminal region of the pigment (Chen et al., 1995b) or ablating GRK1 (Chen et al., 1999). As expected, rods from all three transgenic mouse lines showed similar properties of the single-photon response, with an amplitude reaching a plateau about twice that of wild-type and decaying stochastically to baseline after a long interval of 3 to 5 seconds. GRK1-mediated phosphorylation begins to reduce the activity of R* at ~100 msec after the flash, because this is the time point at which the transgenic response starts to deviate from the WT response (Figure 13). As mentioned earlier, it was estimated in a recent study that the lifetime of R* is ~80 msec (Krispel et al., 2006), suggesting that arrestin binding occurs rapidly after phosphorylation of the pigment. Therefore, GRK1/arrestin mediated shutoff occurs in rods even earlier than the fast Meta-II decay of cone pigment (Kefalov et al., 2003), which is of the order of 1 s after flash (Imai et al., 1997; Kuwayama et al., 2002; Shichida et al., 1994). The GRK1-mediated shutoff likely happens even faster in cones (see below). Mouse and rat are unusual in that the same GRK1 is present in both rods and cones. In all other species studied, another pigment kinase (the so called “cone pigment kinase”), GRK7, is present in cone photoreceptors (Rinner et al., 2005; Tachibanaki et al., 2005; Tachibanaki et al., 2001; Weiss et al., 2001). Indeed, many animal species, including human, have both GRK1 and GRK7 in cones. 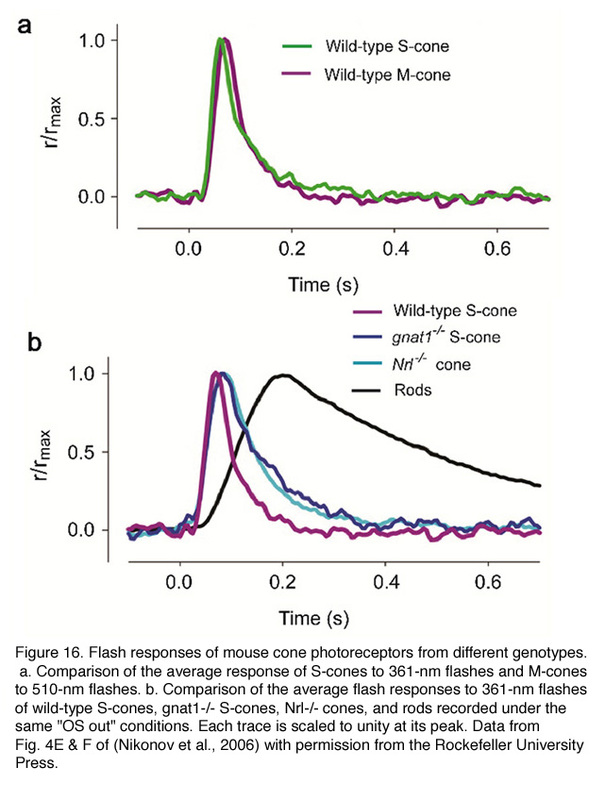 This explains why Oguchi patients with a defective GRK1 gene have normal daytime vision whereas GRK1-null mice have prolonged cone photoresponses (Lyubarsky et al., 2000; Nikonov et al., 2005). Interestingly, GRK7 was shown to have considerably higher specific activity than GRK1 and, in fish, is present at a much higher concentration in cones than GRK1 is in rods (Tachibanaki et al., 2005; Wada et al., 2006). This difference has been proposed as a potential mechanism underlying the faster shutoff and lower sensitivity of cones than rods (reviewed in Tachibanaki et al., 2006). Biochemical experiments suggest that GRK1-mediated phosphorylation of R* is regulated by recoverin (Rec) (Chen et al., 1995a; Kawamura, 1992, 1993; Klenchin et al., 1995), which belongs to a family of calcium-binding proteins. The hypothesis is that, when intracellular free Ca2+ concentration is high in the dark, Rec-Ca2+ binds to GRK1 and inhibits R* phosphorylation. When Ca2+ concentration decreases in the light, Ca2+ dissociates from recoverin; consequently, the resulting affinity between recoverin and GRK1 is reduced, and its inhibition on R* phosphorylation is released. However, this hypothesis was challenged by in vitro measurements suggesting that the extent of R* phosphorylation was unaffected by light adaptation and by changes in intracellular Ca2+ . This controversy was finally settled by recordings from Rec-/- mouse rods (Makino et al., 2004), which showed that Rec-Ca2+ prolongs the dark-adapted flash response and increases the rod’s sensitivity to dim steady light, probably by inhibiting the phosphorylation of R* by GRK1. Furthermore, Rec-/- rods had faster Ca2+ dynamics, indicating that recoverin is a significant Ca2+ buffer in the ROS. In the second step for the deactivation of R*, arrestin binds to phosphorylated R* (R*-P) to cap its catalytic activity. In mouse, the dim-flash responses from rods of arrestin-knockout (Arr-/-) mice do not differ greatly from the wild-type response until in its falling phase, when recovery reaches approximately halfway back to baseline (Xu et al., 1997). Therefore, phosphorylation alone can reduce R*’s activity significantly. The response of Arr-/- rods on average recovers ~10 times more slowly than the response of rods lacking rhodopsin phosphorylation (Figure 13), presumably reflecting the continuous activity of the phosphorylated meta-II state of R* until it decays to inactive meta III. 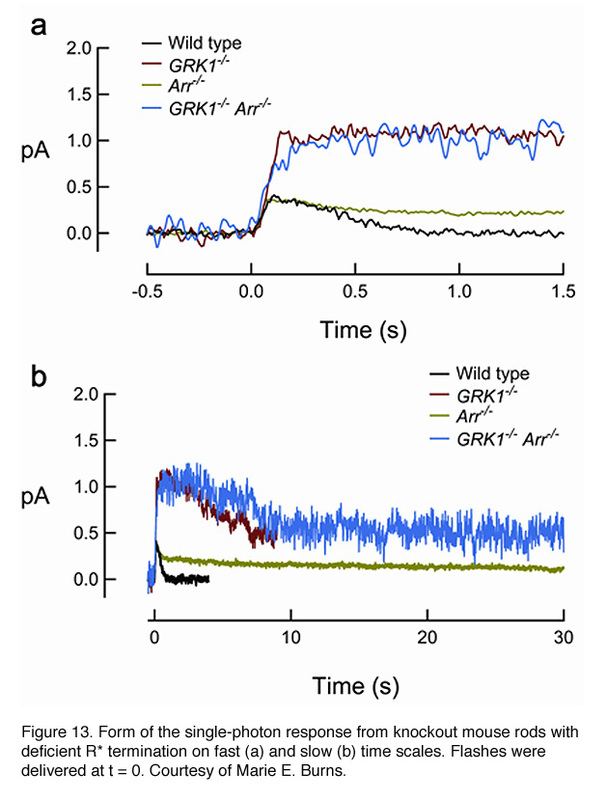 In rods lacking both GRK1 and arrestin (GRK1-/-Arr-/-), the activation phase and peak amplitude of the dim-flash response resemble those of GRK1-/- rods but then decay slowly with a time constant similar to that of the Arr-/- response (Burns et al., 2006), reflecting the decay of non-phosphorylated R. It thus appears that phosphorylation does not influence the decay of R*. At least two splice variants exist for rod arrestin: a full-length (p48) and a C-terminal truncated form (p44) (Smith et al., 1994). P44 has a faster on-rate than p48 for binding R* and R*-P (Palczewski et al., 1994; Pulvermuller et al., 1997). In addition, p44 is more efficient than p48 in turning off R* in vitro (Langlois et al., 1996; Palczewski, 1994). Although p48 is ~10 times more abundant than p44, it translocates from ROS to the rest of the cell in the dark, therefore largely absent in dark-adapted ROS (Broekhuyse et al., 1985; Mangini and Pepperberg, 1988; Philp et al., 1987; Whelan and McGinnis, 1988). This raises an interesting question about the roles of individual isoforms of arrestin in the intact rods. By selectively expressing the two isoforms in mouse rods lacking endogenous arrestin, it was found that both isoforms could quench the activity of phosphorylated R* rapidly. However, only p48 was able to quench the activity of non-phosphorylated R* (Burns et al., 2006). Cones express their own arrestin called cone arrestin or X-arrestin (Arr4) (Craft and Whitmore, 1995; Murakami et al., 1993). Surprisingly, both the rod and cone forms of arrestin exist in mouse cones (Zhu et al., 2005). Arr1 in cones is ~50-fold higher than that of Arr4 (Nikonov et al., 2008). Single cell recordings from cones of mice with one or both arrestins knocked out shows that arrestin is required for normal cone inactivation although removal of one arrestin has negligible effect (Nikonov et al., 2008). Earlier, genetically engineered mouse lines were designed to disrupt R* termination. More recent studies have centered on G*-PDE* termination. G* is inactivated when its bound GTP is hydrolyzed to GDP. Although transducin has a slow intrinsic GTPase activity, the hydrolysis is greatly accelerated by the GAP complex. The complex is composed of a member of the family of regulator-of-G-protein-signaling proteins (RGS9-1, He et al., 1998), the long form of Gβ5 subunit (Gβ5-L, Makino et al., 1999), and a membrane-anchor protein (R9AP, Hu and Wensel, 2002). RGS9-1 has a G protein ν-like (GGL) domain that binds to Gβ5-L, and has an N-terminal DEP (Dishevell/Eg110/Pleckstrin) domain that interacts with R9AP. After hydrolysis, Gα-GDP dissociates from PDEν which allows the latter to re-exert its inhibition on the catalytic PDEαβ subunits (reviewed in Makino et al., 2003). The molecular reactions underlying this step are shown schematically in Figure 14. Even though only RGS9-1 has GAP activity, all three components of the GAP complex are obligatory partners because genetic ablation of any one of them in mouse resulted in an increased instability of the other two through a posttranscriptional mechanism (Chen et al., 2000; Chen et al., 2003b; Keresztes et al., 2004). This is why transgenic mouse rods lacking RGS9-1, G_5-L, or R9AP display a similar delay in the recovery phase of the flash response without much noticeable differences in the activation phase (Chen et al., 2000; Keresztes et al., 2004; Krispel et al., 2003b). In addition, the GAP activity on transducin is enhanced by PDEν (Angleson and Wensel, 1994; He et al., 1998; Skiba et al., 2000; Tsang et al., 1998; see PDE section). This provides an elegant mechanism for ensuring that excitation does not normally decay until G* has bound to the effector, PDE. The same GAP complex is present in both rods and cones; however, its concentration is much higher in cones than in rods (Cowan et al., 1998; Zhang et al., 2003). This has been suggested to contribute to the faster response kinetics of cones than rods. Overexpression of PDEν in mouse rods can accelerate the shutoff of light response independent of the GAP complex, suggesting that the inhibitory sites on PDE α and β are accessible to excess PDEν after endogenous PDEν has been displaced by G* upon illumination (Tsang et al., 2006). Overexpression also reduces the gain of transduction apparently through the “dominant negative effect” of interfering with the binding of G* to endogenous PDEν. 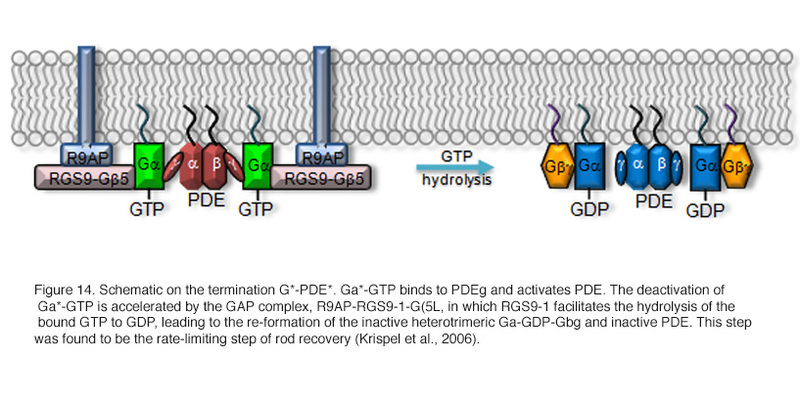 Termination of phototransduction requires the shutoff of both R* and G*-PDE*, with the slower step determining the overall rate of response recovery. The identity of the rate-limiting step for rod recovery has been a long-standing question until recently (Krispel et al., 2003a; Nikonov et al., 1998; Pepperberg et al., 1992; Rieke and Baylor, 1998; Sagoo and Lagnado, 1997). By overexpressing the GAP complex in mouse rods, Krispel et al showed that the recovery of rod response was dramatically accelerated whereas overexpression of GRK1 had no effect (Krispel et al., 2006). This experiment unequivocally demonstrated that the termination of G*-PDE* is the rate-limiting step. It is worthwhile to note that the same step is not necessarily the rate-limiting step in cone recovery because there is a much higher concentration of the GAP complex in cones. The same “overexpression” technique can be used in cones to answer this question. Another implication of the above finding has to do with the question of the reproducibility of the single-photon response (see R* Termination). Because G* deactivation is 2.5 times slower than R* deactivation (Krispel et al., 2006), the slower G* termination dictates the recovery kinetics of the single-photon response of rods. In addition to the multi-step involved in the shutoff of R*, the activation of ~20 transducin by one R* can provide the necessary averaging for an otherwise stochastic process. The free concentration of cGMP is determined by the PDE-mediated hydrolysis and guanylate-cyclase (GC)-mediated synthesis. 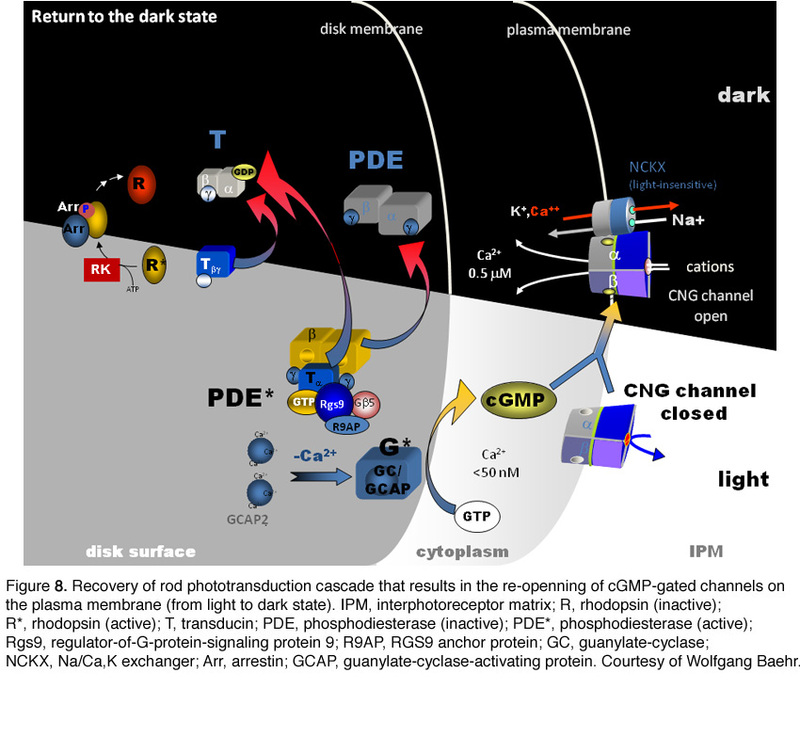 For the photoreceptor to recover, not only is the light-stimulated cGMP hydrolysis by PDE required to terminate as discussed in the previous sections, but the dark level of cGMP also has to be restored. There are two GCs in mouse photoreceptors: GC1 (GC-E) and GC2 (GC-F). GC1 is present in both rods and cones (Cooper et al., 1995; Liu et al., 1994), and GC2 is present only in rods (Lowe et al., 1995). It seems that the basal activity of either GC1 or GC2 is sufficient to maintain dark current in rods (Baehr et al., 2007; Yang et al., 1999). Deletion of either GC has no significant impact on rod sensitivity. GC1 is important for cone function because cones degenerate in its absence. 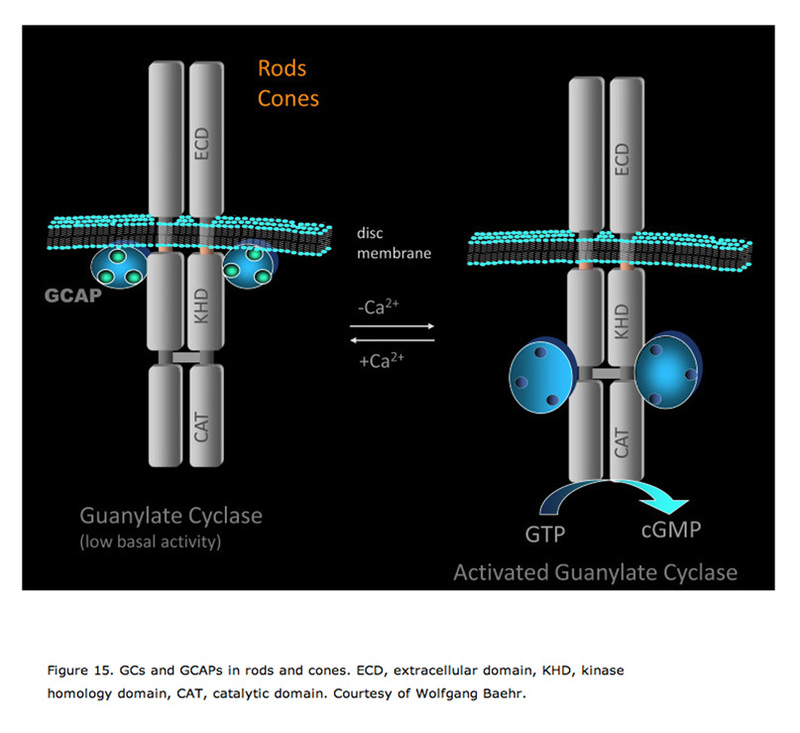 Deletion of both GC1 and GC2 rendered rod and cone photoreceptors nonfunctional and unstable (Baehr et al., 2007). GC activity is regulated by Ca2+, mediated by the guanylate-cyclase-activating proteins (GCAPs). This regulation is the most important negative-feedback mechanism triggered by Ca2+ in the light. For topics on other Ca2+-feedback effects and light adaptation, readers can refer to the following publications ( Burns and Baylor, 2001; Fain et al., 2001; Pugh and Lamb, 2000; Yau, 1994). GCAPs belong to a large family of calmodulin-like Ca2+-binding proteins. Two GCAPs are present in mouse retinas, GCAP1 and GCAP2. Both GCAPs are expressed in mouse rods, but GCAP1 is primarily expressed in cones (Cuenca et al., 1998; Howes et al., 1998). In darkness, the relatively high Ca2+ concentration promotes the formation of the Ca2+-bound form of GCAPs, which inhibits GCs. When the Ca2+concentration declines during the light response, the dissociation of Ca2+ allows GCAP to activate GC, thereby quickly restoring the basal cGMP concentration (Figure 15). The two GCAP genes were knocked out in mouse simultaneously by taking advantage of their tail-to-tail arrangement on chromosome 17 (Mendez et al., 2001). The flash response of GCAPs_/_ rods showed a larger amplitude and delayed decline compared to wild type, consistent with a delay in cGMP synthesis during recovery when the associated Ca2+-feedback was removed. The power of Ca2+-mediated regulation through GCAP can be appreciated from the fact that the single-photon response of GCAPs-/- rods is nearly 5 times that of wild type, versus the 2-fold increase when pigment phosphorylation is prevented. By comparing the light response of GCAPs-/- rods with that of wild-type rods, Burns et al. found that the activation of GC resulting from a change in Ca2+-dependent GCAP activity occurs within ~40 ms after the flash and in a highly cooperative manner, with a Hill coefficient of 4 (Burns et al., 2002). Therefore, the effect occurs much earlier than pigment phosphorylation, which is 80-100 msec after the flash (see R* termination). The rapid feedback to GC has dual effects on photoreceptors, decreasing the dark-adapted flash sensitivity (Mendez et al., 2001) and speeding the restoration of the dark current (Burns et al., 2002). What are the functional differences between the two GCAPs? In vitro, GCAP1 activates GC1 more efficiently than GC2 (Haeseleer et al., 1999; Krylov et al., 1999), whereas GCAP2 activates both GC1 and GC2 with similar efficiency (Dizhoor et al., 1994; Laura and Hurley, 1998; Lowe et al., 1995). In vivo, transgenic GCAP1 can rescue the GCAPs-/- phenotype in rods and cones, as tested by single rod cell recordings and electroretinography, even in the absence of GCAP2 (Howes et al., 2002; Pennesi et al., 2003). Expression of bovine GCAP2 in GCAPs-/- rods restored the recovery of rods to saturating flashes but failed to restore the recovery kinetics of responses initiated by sub-saturating flashes and, in particular, failed to rescue the fast initial phase of recovery (Mendez et al., 2001), suggesting that GCAP1 is responsible for the initial rapid phase of response recovery. GCAP2 speeds up the recovery of flash responses and adjusts the operating range of rods to higher intensities of ambient illumination (Makino et al., 2008). Recently, there have been substantial advances in the understanding of cone transduction with fish as the model (Kawamura et al., 2004; Shimauchi-Matsukawa et al., 2005; Tachibanaki et al., 2005; Tachibanaki et al., 2001; Wada et al., 2006). On the other hand, despite the enormous success in studying rod phototransduction by a combination of mouse genetics and suction-electrode recording in recent years, the usage of mouse as a model system for studying cone phototransduction has until recently been limited to ERG studies. This is mainly due to the rarity of cones (~3%) and the fragility of the cone outer segment (COS). This hurdle was finally overcome by Pugh and colleagues (Nikonov et al., 2005; Nikonov et al., 2006). The conventional suction-pipette recording, which involves drawing the ROS into the suction pipette (“OS in”), is not tolerated well by the more fragile COS. Instead, Pugh and colleagues drew a portion of the inner segment (“OS out”) of a cone photoreceptor in a retinal slice into the suction pipette, allowing long, stable recordings. Previously, it was shown that the same information could be obtained by recording from either outer or inner segment of amphibian rods and cones (Yau et al., 1981) as expected from the nature of the circulating current. To overcome the difficulty of identifying the ~3% cones in mouse retina, Pugh and colleagues used three different mouse lines. The first lacks the neural leucine zipper transcription factor (Nrl) (Mears et al., 2001), which drastically alters the cell fate of rod photoreceptors by turning them into cone-like photoreceptors (Daniele et al., 2005; Nikonov et al., 2005). The second expresses EGFP in mouse cones, which facilitates/verifies their identification (Fei and Hughes, 2001). The third lacks the rod transducin α-subunit (gnat1-/-), which blocks rod phototransduction (Calvert et al., 2000). In the case of the EGFP mouse line, background light is required in order to suppress the rod response so that the cone response can be isolated. As a result, the cone response is slightly light-adapted, therefore slightly faster and smaller for a given test-flash intensity than that from gnat1-/- or Nrl-/- cones. When this factor is taken into consideration, the light response properties of mouse cones recorded from the three mouselines are very similar and are as expected from mammalian cones (Figure 16, Table 3) (Nikonov et al., 2006). Prominent among these features is that mouse cones are far more tolerant than mouse rods to bleached pigment. The dark current recovers substantially in both S- and M-type cones following strong flashes that bleach a substantial fraction of the pigment. One surprising finding, however, is that the inactivation of M pigment is more retarded than that of S pigment in the absence of GRK1, suggesting the existence of a GRK1-independent inactivation mechanism for the S pigment. Nrl-/- cones differ from wild type in certain respects. Their outer segments are shorter, more disordered and undergo a slow degeneration (Daniele et al., 2005). In addition, in contrast to wild type, Nrl-/- cones express a much higher percentage of S-opsin. Thus, transgenic mice expressing EGFP in their cones and gnat1-/- mice are better than Nrl-/- mice for studying cone physiology. 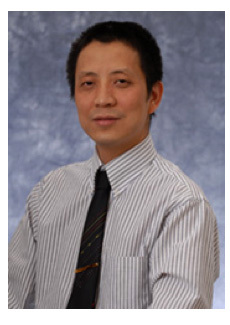 In the past decade, great progress has been made in using mouse models to elucidate the mechanisms of activation and termination of the rod phototransduction pathway. Although there are still questions to be answered about the rod pathway such as the reproducibility of the single-photon response, the current frontier of phototransduction research lies in cones, which, for human vision, are far more important than rods. The recent success in recording from single mouse cones ushers in a new era in research on vertebrate cone phototransduction. Many long standing questions, e.g., the mechanisms for the enormous ability of cones to adapt to light, and the differences between rods and cones in sensitivity and kinetics, can now be addressed with a combination of mouse genetics and electrophysiology. Autrum H. Über kleinste Reize bei Sinnesorganen. Biologisches Zentralblatt. 1943;63:209–236. 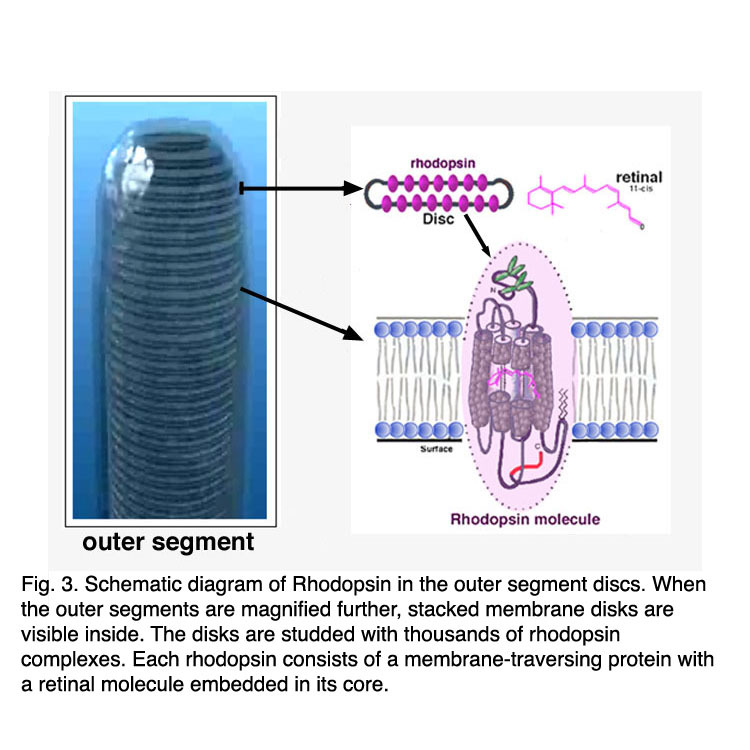 Bridges, C.D.B., The rhodopsin-porphyropsin visual system. Handbook of Sensory Physiology, VII/1. Photochemistry of Vision, ed. H.J.A. Dartnall. Vol. VII/1. 1972, Berlin-Heidelberg-NewYork: Springer. 417-480. Kawamura, S., et al., Mechanism of rapid visual pigment phosphorylation in carp cones. Invest. Ophthalmol. Vis. Sci., 2004. 45: p. E-Abstract 2207. Liang, Y., et al., Rhodopsin signaling and organization in heterozygote rhodopsin knockout mice. J Biol Chem, 2004. Molday, R.S. and U.B. 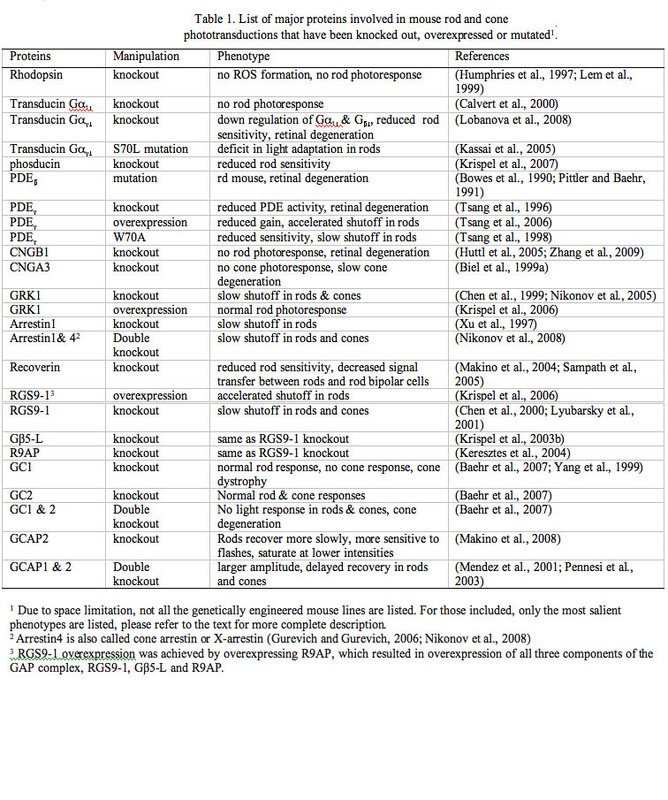 Kaupp, Ion channels of vertebrate photoreceptors, in Handbook of Biological Physics, D.G. Stavenga, W.J. de Grip, and E.N. Pugh, Jr., Editors. 2000, Elsevier Science B.V.: Amsterdam. Palczewski, K. (1994). Structure and functions of arrestins. Protein Sci 3, 1355-1361. Pugh, E.N., Jr. and T.D. Lamb, Phototransduction in Vertebrate Rods and Cones: Molecular Mechanisms of Amplification, Recovery and Light Adaptation., in Handbook of Biological Physics, D.G. Stavenga, W.J. de Grip, and E.N. Pugh, Jr., Editors. 2000, Elsevier Science B.V.: Amsterdam. p. 183-255. Schneeweis, D.M., and Schnapf, J.L. (2000). Noise and light adaptation in rods of the macaque monkey. Vis Neurosci 17, 659-666. Tachibanaki, S., et al., Molecular Mechanisms Characterizing Cone Photoresponses. Photochem Photobiol, 2006. Zhu, X., et al., Rod arrestin expression and function in cone photoreceptors. Invest. Ophthalmol. Vis. Sci., 2005. 46: p. E-Abstract 1179.